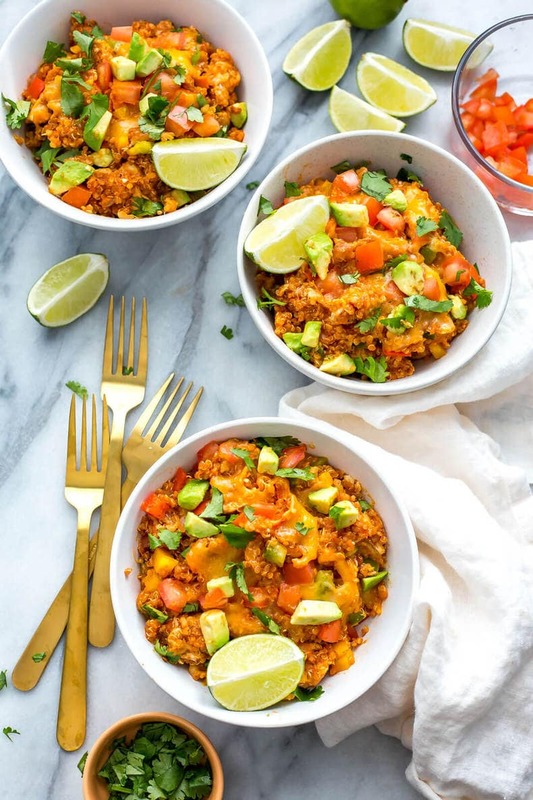 This Instant Pot Enchilada Quinoa Casserole is a delicious one pot Mexican chicken recipe that is ready in 30 minutes or less - it's also gluten-free and requires very little clean up so it's the perfect weekly meal prep! Add all ingredients except for bell peppers, cheese, avocado, plum tomatoes and cilantro to Instant Pot in the order written, making sure to add quinoa last. Set to manual and pressure cook on high for 3 minutes. Instant Pot will take about 10 minutes to pre-heat and then the 3 minutes to cook. When complete, press cancel and do a quick release of the steam, waiting until the pressure gauge drops back down and the lid is safe to open. Stir in bell peppers and top with cheese, avocado, plum tomatoes and cilantro. Serve among 6 bowls and enjoy!